Chicken Marsala is one of my favorite Italian dishes to make. It is such a simple recipe and is so easy to make. The only tricky part is trying to make sure the chicken breasts are cooked through without turning them soggy. Using sous vide to pre-cook the chicken breasts eliminates this issue. Using sous vide chicken breasts instead of the usual "pan-fried and simmered" method ensures that your chicken is cooked thoroughly and you can easily give them a nice crust with a quick sear over high heat. By eliminating the simmering at the end the crust on the chicken stays nice and crisp and never becomes soggy. Another benefit of using sous vide chicken is that you can use thicker chicken breasts. 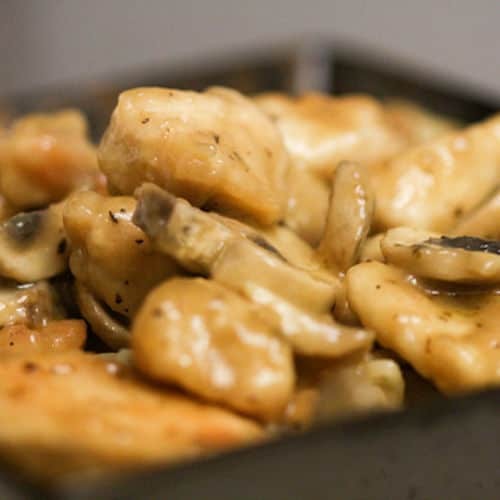 Normally, when you make chicken Marsala you pound the chicken into thin filets, about ¼ of an inch thick. Using the normal method of preparing marsala this helps to ensure that the chicken is cooked through during the simmering stage. I prefer a little thicker and juicier chicken breast so I normally butterfly the breast and then cook it sous vide. The process of making sous vide chicken Marsala is very easy and results in a more moist and hefty dish. It's great when served with a warm baguette and some angel hair pasta to soak up all the great sauce. If you would like more information about the modernist techniques, ingredients, and equipment used in the Sous Vide Chicken Marsala you can check out the following. Pre-heat the water bath to 141F. Lightly salt and pepper the chicken breasts and place in a pouch. Add the thyme to the sous vide pouch and then seal them. Place the chicken breasts in the water bath and cook for around 1½ to 2 hours. The rest of the sous vide chicken marsala is made in the usual manner. Heat some olive oil in a sauté pan over high heat. Remove the sous vide chicken breasts from the pouch, pat them dry with a paper towel or dish cloth. Dredge them in the flour and then quickly sear the chicken breasts for about 1 minute per side, just enough time to develop some color. Remove and place somewhere warm. In the pan that you seared the chicken in, add 1 tablespoon of butter and melt on medium-high heat. Add the sliced mushrooms to the pan and sauté until they begin to brown and release their liquid, about 4 to 6 minutes. Lower the heat to medium and add the Marsala wine to the pan. Simmer for about 1 minute to cook out the alcohol, scraping the bottom of the pan to dislodge the browned bits stuck there. Add the chicken stock to the pan. Let simmer for 5 to 10 minutes to reduce the sauce. Normally you would add the chicken back into the pan to help it finish cooking but since we sous vided the chicken it is unnecessary. Put the sous vided and seared chicken breasts onto individual plates. Stir the remaining 2 tablespoons of butter into the sauce. Then spoon the mushrooms and Marsala sauce evenly over the chicken breasts. Sprinkle the Italian parsley over the top and serve. The sous vide chicken marsala is great when coupled with a warm baguette and some angel hair pasta to soak up all the great sauce. Asparagus or steamed broccoli also goes very well. Marsala is one of my favorite Italian dishes to make and using sous vide chicken guarantees fully cooked and tender meat.